MoreBeer.com Coupon Code Description: Right now you can get the best price around on stainless steel home brewing cam lock fittings at MoreBeer.com. Not only can you save 60% or more on these stainless homebrewing cam locks but they also qualify for the MoreBeer, free shipping offer! Act fast because this deal won’t last long! Click the link for all of the details and to take advantage of this limited time Morebeer.com promo code. MoreBeer.com Coupon Code Description: Get a new glass 3 gallon carboy for the best price around! Just $14.99 for a NEW Glass 3 Gallon Home Brewing Carboy with you use the MoreBeer.com Promo Code BEERDEAL at checkout with the carboy added to your cart. This MoreBeer promo code expires at the end of the day, so act fast while supplies last. Click the link to take advantage of this limited time and limited quantity promo code from More Beer! 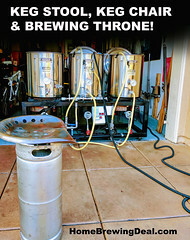 MoreBeer.com Coupon Code Description: Today at MoreBeer.com Save $6 On A Zombie Dust Homebrewing Beer Kit. Just add the all grain or extract beer kit to your cart and make sure that you add the promo code 6FEET at checkout. 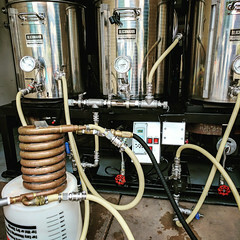 This Zombie Dust Homebrewing Recipe features a malty with a huge Citra hop presence, this is our clone of the nationally known and loved Zombie Dust Pale Ale by 3 Floyds Brewing. This recipe falls right in line with the original featuring Munich, Crystal 60L, and Carapils malts along with fresh 2-row base malt to create a smooth malt backbone with a nice mouthfeel. The only hop in this beautiful beer is Citra, but there’s a whole lot of it! With half a pound per 5.5 gallon batch, the Soulless Hop Pale Ale is a prime example of just how amazing Citra hops truly are! MoreBeer.com Coupon Code Description: There is a sale going on right now at MoreBeer that will save you $10 and get your free shipping when you purchase a 25 pack of Oak Sticks! Beer Sticks Oak Fermentation Sticks are one of the simplest and easiest forms of oak to use in home beer making. Simply add a oak stick to 5 – 6.5 gallons, and enjoy the results a couple months later. When it comes to removing the stick, there’s no fumbling around with cubes trying to get them through the neck of a carboy. These are made with a hole at the top so you can lift the Beer Stix out with fishing line when done. 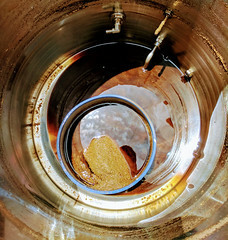 American Oak toasted and the beer stix milling will give you flavors and aromas of roasted coffee, light chocolate and honey, as well as some spice notes and hints of leather. Every beer will accentuate, or mask different flavors from the oak, so expect some variation between beers! MoreBeer.com Coupon Code Description: This week at MoreBeer, they have an incredible new promotion running that will save you 25% On Pliny the Elder All Grain and Extract Home Brewing Beer Kits! In order to take advantage of this limited time More Beer deal on Pliny the Elder homebrew kits, make sure that you enter the MoreBeer.com promo code KOTW at checkout and save 25%! 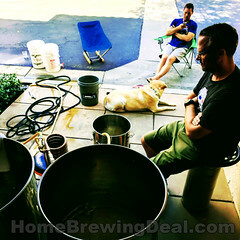 Click the link for all of the details and to take advantage of this homebrewing deal from MoreBeer! Don’t forget, you will also get FREE SHIPPING on orders over $59 at More Beer. MoreBeer.com Coupon Code Description: Use the More Beer promo code 5FISH and save $5 on each More Beer Ugly Fish IPA beer kit that you purchase. The More Beer Ugly Fish IPA was designed as a clone of Ballast Point Sculpin IPA and it is delicious. There are multiple versions of this home brewing kit available including Pineapple and Grapefruit versions. If you haven’t tried any of these Fish out yet, now is the perfect time to reel one in. Plus get free shipping on orders over $59 at MoreBeer! Coupon Description: Right now More Beer has a sale going on where you can save 10% on their line of PET Plastic home brewing carboys! If it was not already a great deal, you also get free shipping on and order over $59 from More Beer!